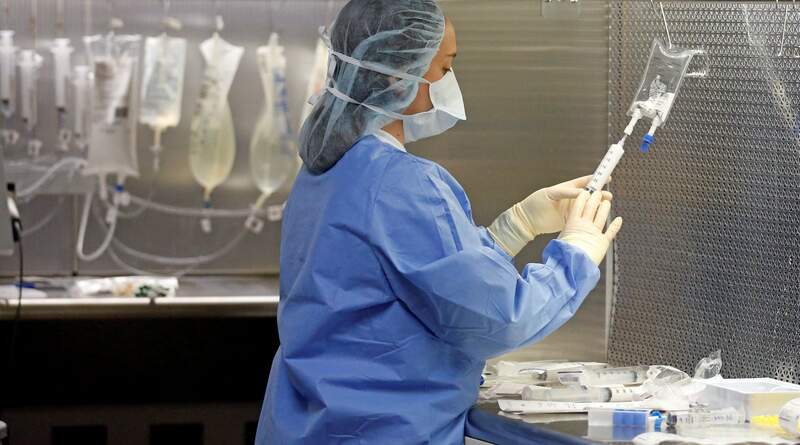 A pharmacy technician prepares syringes containing fentanyl in the sterile medicines area of the inpatient pharmacy at the University of Utah Hospital, in Salt Lake City. Amid the nation’s opioid epidemic, hospitals are struggling to get widely used injected pain medicines because of ongoing supply shortages. The shortages affect just about every corner of the hospital, from the operating room and emergency department. TRENTON, N.J. – There is another opioid crisis happening in the U.S., and it has nothing to do with the overdose epidemic: Hospitals are frequently running out of widely used injected painkillers. Manufacturing shortages are forcing many doctors and pharmacists to sometimes ration injected opioids, reserving them for the patients suffering most. Other patients get slower-acting or less effective pain pills, alternatives with more side effects or even sedation. Medical groups are urging regulators to help, saying some people having surgery, fighting cancer or suffering with severe burns are getting inadequate pain control. They also say shortages frequently cause medication switches that could lead to deadly mistakes. In June, the American Medical Association declared drug shortages a public health crisis, saying it will urge federal agencies to examine the problem as a national security threat and perhaps designate medicine factories as critical infrastructure. Injected opioid shortages have happened before, in 2001 and 2010, but they weren’t as acute and long-lived, experts say. This one started almost a year ago and is expected to last into next year. “It’s definitely the most severe I’ve seen in tracking drug shortages for 17 years,” says Erin Fox, a University of Utah Hospitals pharmacist. She tracks national medicine shortages and recalls two patients dying due to medication errors during the 2010 shortage. Such shortages steal time from patient care, increase hospitals’ costs and affect just about every department, including operating rooms, emergency departments and cancer clinics. Doctors occasionally find opioids missing from emergency carts and surgery supply trays, “borrowed” by colleagues needing them for other patients. Vials of the local anesthetic lidocaine, currently in short supply, are shown in the inpatient pharmacy at the University of Utah Hospital in Salt Lake City. The shortages started hitting hospitals last summer, after the Food and Drug Administration found sterility and other serious problems at a Pfizer factory in Kansas. The company, which makes 60 percent of the country’s injected opioids, had to slash production to fix the problems. By January, shortages were so bad hospitals started creating teams to manage their supplies, said Michael Ganio, director of pharmacy practice at the 45,000-member American Society of Health-System Pharmacists. The group’s April survey of 343 hospital pharmacists found 98 percent had dealt with moderate or severe shortages of the key opioids for treating serious pain: morphine, fentanyl and hydromorphone, better known as Dilaudid. Many hospitals were completely out of at least one. Shortages of generic injected drugs have become normal. Profit margins are tiny, so only a handful of companies make them, and none can dramatically increase production when a rival stops manufacturing. With the opioid shortages lingering, hospitals and medical groups have set guidelines for stretching supply, including transferring injected painkillers from large vials into several smaller ones or syringes. Some worry such workarounds invite mistakes. Michael Cohen, president of the Institute for Safe Medication Practices, an independent group that compiles voluntary error reports, says mix-ups also occur when nurses or pharmacists substitute unfamiliar painkillers or ones with different concentrations than normal. Cohen recently received several reports of surgical patients who stopped breathing. Some had overdosed when fentanyl wasn’t available and they were mistakenly given the same amount of much stronger sufentanil. Those patients were saved. Hospitals also are grappling with shortages of regional anesthesia – local injections of lidocaine, bupivacaine and a third painkiller standard for eye surgery, orthopedic procedures and knee and hip replacements. Dr. Ruth Landau, director of obstetric anesthesia at Columbia University Medical Center in New York, says maternity wards for months have faced a critical shortage of the fast-acting version of bupivacaine. That’s risky because if a woman in labor starts bleeding or her baby isn’t getting enough oxygen, obstetricians must perform an emergency cesarean. Anesthesiologists sometimes have had to use a slower-acting bupivacaine version, which may delay delivery and could harm mother or baby. “We’re playing with fire,” worries Landau, a vice president of the Society for Obstetric Anesthesia and Perinatology. In the emergency department at Massachusetts General Hospital in Boston, Dr. Ali Raja recently had an appendicitis patient who needed intravenous morphine or low-dose Dilaudid. Instead, he had to resort to fentanyl, which wears off quickly, so additional doses were needed frequently. “He was lucky. The nurses were free to do it, and so he wasn’t in more pain,” Raja recalls. That’s not an option for the many hospital patients who are sedated, intubated, vomiting or too frail to swallow pills. And because pills can take 45 minutes to start working, they’re a poor choice for patients with broken bones, internal infections and stabbing or gunshot wounds. Often, patients need a slightly higher opioid dose than one vial holds, but opening a second vial requires discarding the unused portion to avoid contamination. “Having to choose between underdosing the patient or not having a medication to treat another patient later that day is incredibly frustrating,” Raja says. At MD Anderson Cancer Center in Houston, palliative care specialist Dr. Ishwaria Subbiah now devotes extra time to choosing painkillers as availability changes. She says already-distressed advanced cancer patients need reassurance when she is forced to take them off a scarce injected painkiller that was working. “Cancer pain can be absolutely excruciating, more than what a pill can manage,” Subbiah notes. At Salt Lake City-based Intermountain Health Care, outpatient surgery facilities and cancer clinics are as affected as acute-care departments, and which painkillers are scarcest varies constantly, says chief pharmacy officer Sabrina Cole. Valerie Jensen, FDA’s head of drug shortages, says the shortages triggered by Pfizer’s problems may ease slightly in the next few months. The three much-smaller makers of injected opioids – Fresenius Kabi, West Ward and Akorn – have begun making more. They’re putting factory workers on overtime, adding more shifts and switching some manufacturing lines from less-crucial medicines to injected opioids. The FDA has been expediting approvals those companies need to make more opioids, including allowing new product formulations. The agency also let Pfizer distribute some glass syringes prefilled with opioids that were held back because of possible particle contamination and cracks in stoppers. Hospital pharmacists have to examine each syringe closely and then filter the contents in a complex, multi-step process. Meanwhile, Pfizer Inc. doesn’t expect to have most of its injectable opioids back in full supply until the first quarter of 2019, says John Kelly, the firm’s head of manufacturing quality. The New York-based company acquired the McPherson, Kansas, factory when it bought the drugmaker Hospira in 2015. To fix the plant’s troubles, Pfizer decided to replace production lines and other technology, particularly huge equipment-sterilizing machines called autoclaves that can take two years to build, install and test. It’s spent more than $300 million so far. Planned shutdowns last summer to start upgrades took longer than expected, FDA inspectors found other problems that needed fixing, and product demand rose, triggering shortages, says Kelly. He says production now is increasing somewhat each week.